About-France.com - the thematic guide to France. 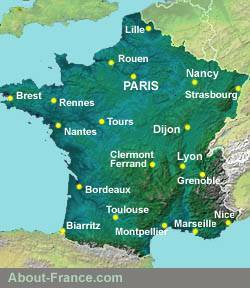 The main tourist attractions and sights in France - monuments, art galleries, seasides, and more. Cities, towns, departments, regions, climate, wine areas and more. Key topics of French grammar, explained with clear examples. There are three ways to search for information on About-France.com. ► Or use the site-search function in the search box below: Type a key word into the box below . Your results will show up below.... probably after some ads from Google. A selection of pages and info on About-France.com.